Installing WordPress on Heroku Cloud Video will assist you to install WordPress using PostgreSQL from GitHub Repository. It is an add on post for the main guide. Installing WordPress on Heroku Cloud Video Guide has been created for getting a visual idea for Installing WordPress on Heroku Cloud either for standalone usage or for Facebook App. There are quite good number of Heroku Specific Guides in this website. The most important for this guide is how to update Facebook PHP App, when WordPress is installed on Heroku Blog Cloud. You will get the other needed tutorial links on that webpage like how to create Facebook App. Watch the video for Installing WordPress on Heroku Cloud Video Guide, read the text and match the timings written here. In this Video Guide for Installing WordPress on Heroku Cloud, we added some extra steps as troubleshooting as people complained of having issue with Ubuntu during Cloning. 0:08 : We ran the command which git, it would return result if any git was installed. 0:14 : As we were working from Ubuntu, when we opened Heroku Tool belt webpage, the Ubuntu/Debian version was highlighted. 0:22 : We copied the command needed to install Heroku Tool Belt. 0:33 : We pasted the command on Terminal and pressed the Enter key from keyboard. 1:34 : We cleared the CLI by the command clear after Tool Belt Was installed. 1:50 : Shows how to login from Terminal in to Heroku Cloud. 2:50 : Up to this point, the video is self explanatory. You will see that we have emulated the problem of cloning. It only happens if you do not generate the key. If you pause at 03:56 on the video, you will notice the normal way of generating the Key first and then flawless cloning of the Git. We Hope this Video on Installing WordPress on Heroku Cloud have helped those who were facing issues. Tagged With how to install wordpress to heroku , install wordpress heroku , using wordpress on heroku? This Article Has Been Shared 2393 Times! Excellent post. I was checking constantly this blog and I’m impressed! Very useful info particularly the last part :) I care for such info a lot. I was seeking this particular info for a long time. Thank you and good luck. 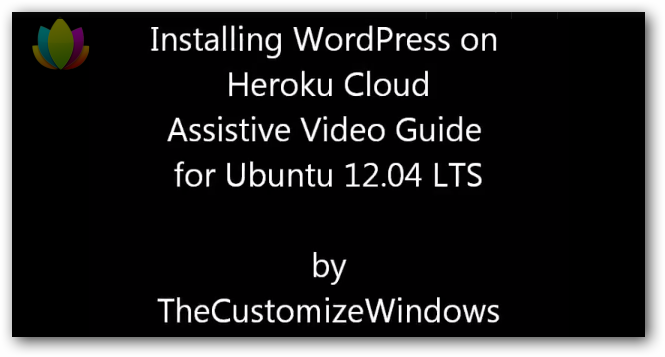 Cite this article as: Abhishek Ghosh, "Installing WordPress on Heroku Cloud : Video Guide for Help," in The Customize Windows, November 7, 2012, April 21, 2019, https://thecustomizewindows.com/2012/11/installing-wordpress-on-heroku-cloud-video-guide-for-help/.